Too many records to review, so much to choose from, resulting in Adore Life remaining on a pile of records to do. This album is one of those records that I like, but also are of a category that I do not play that often. Post-punk, new wave, 80s doom and gloom, the music of Savages is inspired by that age and mixed with a little grunge. In other words, a lot of noise from guitars, bass and drums is produced. To capture me there has to be room for melodies and interesting vocals and harmonies as well. Just the beat and noise are not enough and never have been. On top of that the gloomy side of new wave was never my favourite and still I'm not pleased with having to listen to Siouxie, Comsat Angels or (especially the early) Simple Minds. How do I cope with a 2016 record that so obviously was inspired deeply in that period? 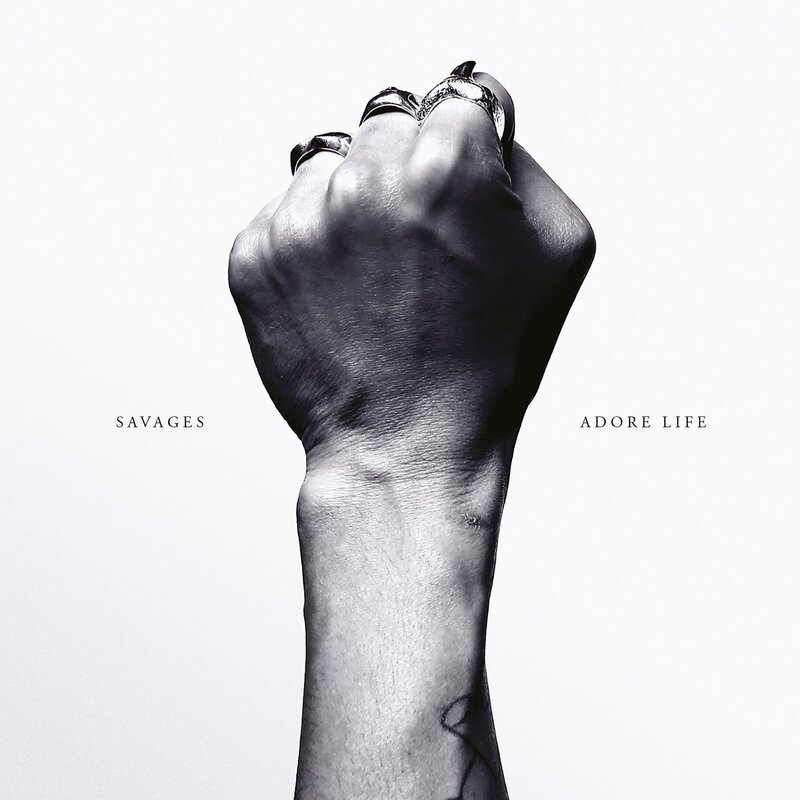 Savages is a band form London that started in 2011. Looking up on the band I'm surprised to find a link to a review that I have written in 2013 on debut album, 'Silence Yourself'. It is also clear that I didn't really make something of the record, reading the review again. I have no recollection of the album, I have to admit. It seems like it had its moments. These moments are certainly there on Adore Life. On the top points are the influences of Patti Smith that found their way into the music. In the up tempo as well as in the more empty songs, as the beginning of 'Adore'. Jehnny Beth sings whole sequences of her vocals with a Patti Smith intonation, but can switch just as easily to a much lighter voice. A quality that opens up a song like 'Adore' from the very moment the song changes to a rough sort of dreampop. Although Ms. Beth's voice can sound a little theatrical, she has a voice that can carry a song in different ways. Only to follow the vocal melodies already makes Adore Life interesting. The song 'Adore' is plain impressive. Under that voice Savages is able to create a few different moods, swinging somewhere between greyish and pitch black, but always drenched in echo. The texture is rough. If the music was a knife, it wouldn't be a sharp one but a blunted old bread knife, wreaking havoc on flesh. Proceeding further into the album a certain saturation to Savages presents itself. My 80s deficiency plays up, but has changed somewhat. The better recording technique and the fact that the neutron bomb is not hovering above our heads any longer, makes Adore Life breath more. "I need something new" is rather a different form of anxiety than the end of the world as we know it, although there are people that try to scare us day in day out in 2016 with a lot lesser sort of problems than mass extinction. Topics that all artists seem to shy away from in 2016. Things have changed. "I think I'm in love" over such dark sounds? All these musicians that are circa 60 years old now, must see it as some sort of sacrilege of their music, I'd say. 'T.I.W.Y.G.' is probably my favourite. Savages goes all out in this one. A dark post-punk rocker of a song. The dark upbeat is "compensated" straight away by the dark, moody 'Mechanics'. All mood, the result of a lot of stripping of the original composition and coming up with something completely different. Something that has been done many times before, but none the less impressive. Quite a way to end an album. So the saturation is turned around by Savages and complements are due.As I wrote: things have changed. Savages is able to find an interesting melody in most of the songs or is able to come up with a lot of tension within a song, like in the already lauded 'Adore'. This is what makes Adore Life an interesting album to listen to. I'm not completely convinced by a Savages album, again, but am still listening, so who knows what may happen in the future? ik heb nog een ticket over voor optreden in Botanique. Interesse? Nee, dank, iets te ver weg. Ik laat de reactie even staan, misschien iemand anders die het leest.